Share a poem with your promise. A promise ring poem can be the perfect way to present this special, sentimental piece of jewelry, but it can also be a challenge to find just the right verse to convey the strength and meaning behind the promise the jewelry represents. Poetry is universally recognized as expressive, emotional, and heartfelt. By choosing a poem to accompany a promise ring, the giver can share intimate feelings, define the nature of the promise, and offer their meaningful commitment with grace and flair. This is especially true for promises meant to convey romantic interest, when a poem can share the love and tenderness between the couple in a highly symbolic and memorable way. There are many types of poems that can be used to present a promise ring. Reading through a book of poems may help the giver find the perfect verse to express their promise, or they may prefer to investigate romantic song lyrics, classic sonnets, or marriage proposal poems that can be adapted for their specific promise. When presenting a religious promise ring, a favorite psalm or scripture verse can be an appropriate poem choice. A fun promise between best friends could even be accompanied by a catchy limerick. Matches the type of promise. A romantic poem, for example, is perfect for a promise ring meaning a future engagement, while a poem centered on friendship and camaraderie is best for platonic friends exchanging matching promise rings. Is the right length. Many people will want to recite the promise poem while they present the ring, but a long epic poem can be too overwhelming and difficult to memorize. Is easy to understand. Difficult vocabulary, an unusual rhyme scheme, or unfamiliar imagery can make the poem more confusing than meaningful. Sometimes, the best poem to convey a special promise is one that you will write yourself. If you do choose to write your own poetry, these tips can help. Speak from the heart and don't be afraid to show your emotions about the promise you are making. Define the promise clearly in terms of intent, time, and the strength of your commitment. Don't feel confined to highly structured poetry formats. Instead, choose a type of poem that works to express your emotions. 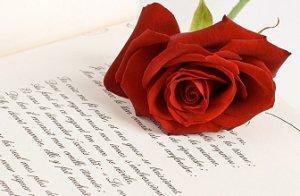 Read your poem aloud to determine if it will sound correct when it is recited at that special moment. Practice the poem so you can feel confident when you make your promise. While most people who choose a promise ring poem to accompany this symbolic jewelry opt to recite the poem, printing out a copy can be a lovely memento of the heartfelt emotion when the poem was first read or recited. You can give the printed poem along with the ring, or save it for another special occasion as a reminder of the promise you share. Be sure to print the copy clearly in an easy-to-read, but elegant, font. A framed poem can become a cherished keepsake, or the poem can be tied into a whimsical scroll. For even more sentiment, consider having a special line or phrase from the poem engraved into the promise ring. Preparing a short speech about your commitment to the promise. Choosing an appropriate song to play while you present the promise ring. Creating a meaningful piece of artwork to share that is connected to the ring and the promise being made. A promise ring poem can be a meaningful and sentimental way to share a promise and present a beautiful promise ring, but choosing just the right poem can be a challenge. By investigating different resources for suitable poetry and considering poem alternatives, you are sure to be able to find just the right way to express what the promise means to you.